Ultra panels for walls and ceilings are tough, practical, waterproof and above all visually attractive. Whichever one of the tasteful designs you choose the result is always elegant and original. We offer a wide range of stylish panels made of high quality pvc. All the exclusive designs have been specially developed with the latest trends in mind. 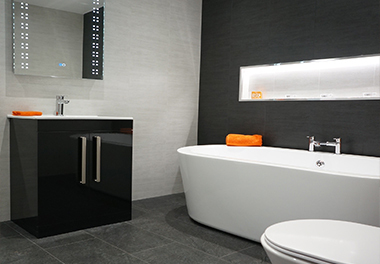 An alternative to tiles, wall panels have the advantage of no grout, less sensitive to condensation and easy to clean. Composite tiles, 100% maintenance free and zero grout! When installed, your wall will exude the natural charm of a genuine tiled wall. The authentic built-in grout line can be seen and felt, but you will no longer have to deal with dirty, mouldy and crumbling grouting. It goes without saying that all our tiles are 100% waterproof so they can be fitted in wet rooms without any problems. In fact, our tiles are ideal for this purpose as they are made from Composite materials. HHI composite wall tiles offer high-impact resistance and are colour fast as they are made from completely solid, UV-resistant panels. 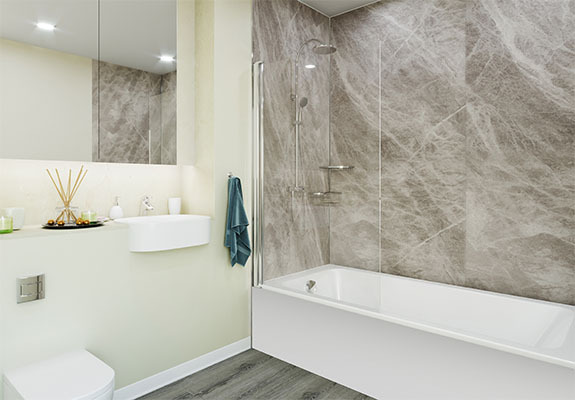 Whether you are fed up with the grouting, or are simply looking for a new and fresh look for your bathroom, Ultra Panel Plus waterproof wall panels provide the perfect solution. Our selection of 32 decors range from traditional stone, to sparkles, to striking modern designs, in gloss and textured finishes. The panels can be applied to timber battens or directly bonded to the wall, with a range of aluminium sections permitting quick and easy installation. Our precisely engineered Hydro-lock tongue and groove joint allows a tight and discrete joint to be created between panels. Watertight sealing of Ultra Panel Plus is achieved using silicone sealant at all joints. As an alternative to using end caps, panels can be lipped with a PVC edging to compliment your chosen décor. Bath/shower tray seal kits, access kits, high grab adhesive and sealant and all-in-one kits for shower or baths are all available to order. 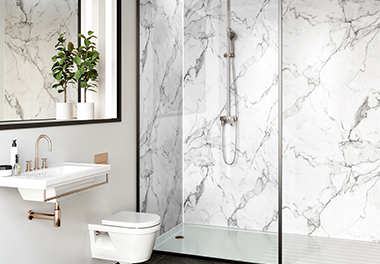 In addition to bathrooms, the versatile and durable panels are suitable for a variety of domestic and commercial applications.